It’s the most magical place on Earth. At least, that’s what Disney World claims. But what about for tweens? Will your kids (ages 9-12) enjoy the Magic Kingdom. We decided to test the waters and see if our tween children would enjoy a visit to the Magic Kingdom (we know, it’s a tough job, but someone’s got to do it). We entered the park curious if our 11-year-old son would enjoy the rides, considering he’s ridden faster, more extreme rides. Would our kids appreciate the Imagineers design creations while waiting in lines for rides? Might our daughter, who loved Disney when younger, find the decorations and the characters too cutesy now that she’s getting older? During our trip to the Magic Kingdom, we rode nine rides, watched the fireworks and parade, and ate and souvenir shopped in the park. In the end, we answered the question: Is Disney still enjoyable for a hard-to-please, been-there-seen-it-all tween? The castle and stage hosts many special events during the Not So Scary Halloween Party. How Do the Rides Fare? Our biggest concern with taking our tweens to the Magic Kingdom was their ride experience. After all, our kids have a season pass to an amusement park with many extreme thrill rides. They are used to loop de loop rides with big drops and a few corkscrew turns. Disney doesn’t have rides sending you upside down at rocket ship speeds. We were able to ride the roller coaster and some of the gentler, family-friendly attractions. Our kids were surprisingly pleased with all of our rides. 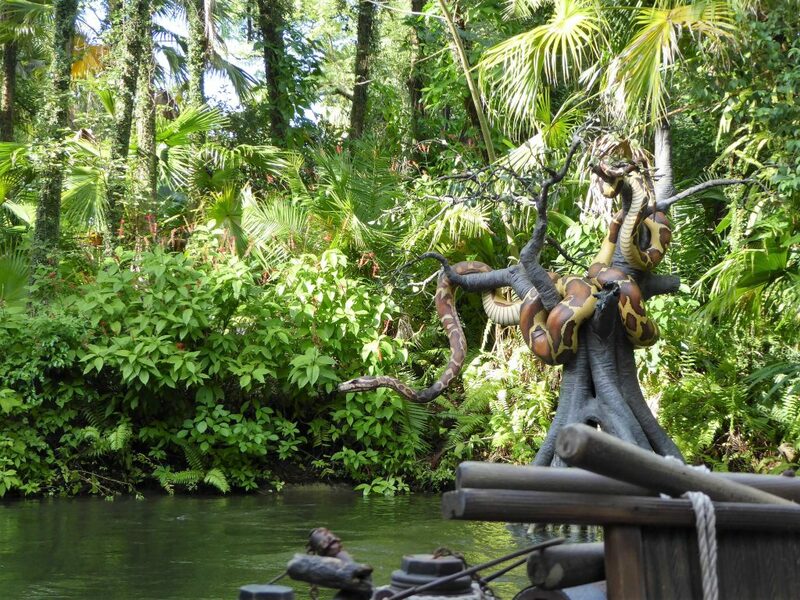 Our first park attraction was the jungle cruise. We had a Fast Pass, so our wait was short. Unfortunately, this meant that we missed out on some of the design features present as you snake through the queue. Once on the ride, we experienced the same cheesy jokes delivered with deadpan humor that my wife and I have heard many times. However, the jokes were novel for our kids. Our son especially liked the silly jokes, such as the pride of lions “babysitting” the zebra. The Verdict: An amusing ride with a lot of corny jokes. We also had a Fast Pass for the plunging log ride. Our wait was longer for this ride, so we were able to admire some of the Disney Imagineers’ designs. Our daughter was unsure about this ride. Although she’s conquered bigger rides, she’s now hesitant to ride the big thrill attractions. We coaxed her into the log ride, telling her that it was nothing compared to other rides she already enjoyed. The kids really enjoyed the meandering ride. Of course, they were overjoyed when I got wet from the splash of another car plummeting down the drop. Their anticipation for the big drop rose with every turn in the tunnels. They also appreciated the whimsical cutesy forest creatures lining the path. Don’t tell anyone, but I caught our son humming the “Zip-A-Dee-Doo-Dah” while we coiled through the waterway. They took the 52.5 foot plunge like pros. The Verdict: A great ride that they would do again. Once again, we had a Fast Pass for the roller coaster, skipping most of the line. Our wait time was around 10 minutes. 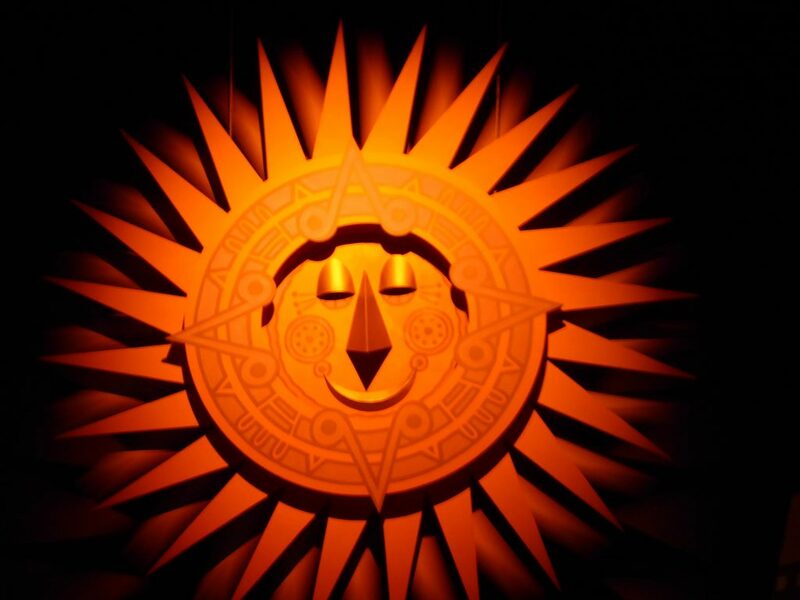 This is my wife’s favorite ride at the Magic Kingdom. We love the speed and the hairpin turns along the fast-moving coaster. The kids enjoyed the ride since the coaster’s speed is similar to other thrill rides. They also liked the fun design features throughout the rolling tracks (bats, boats, etc). The Verdict: The kids really enjoyed this thrill ride and would happily ride it again. There is enough thrill to entertain our tweens. It’s the newest ride at Disney’s Magic Kingdom. It’s also the one ride new to us. So everyone was really excited to try out this one. This was our final Fast Pass ride. We waited about 10 minutes to get on board our mine cart, ready for our trip through the mountain caves in search of jewels. The ride was surprisingly speedy and we enjoyed how each mine cart swayed. The tilting mine carts made for a fun adventure as we jostled back and forth through the hairpin turns and small drops. We felt like we were plunging out of control as we swayed to and fro in our cart. 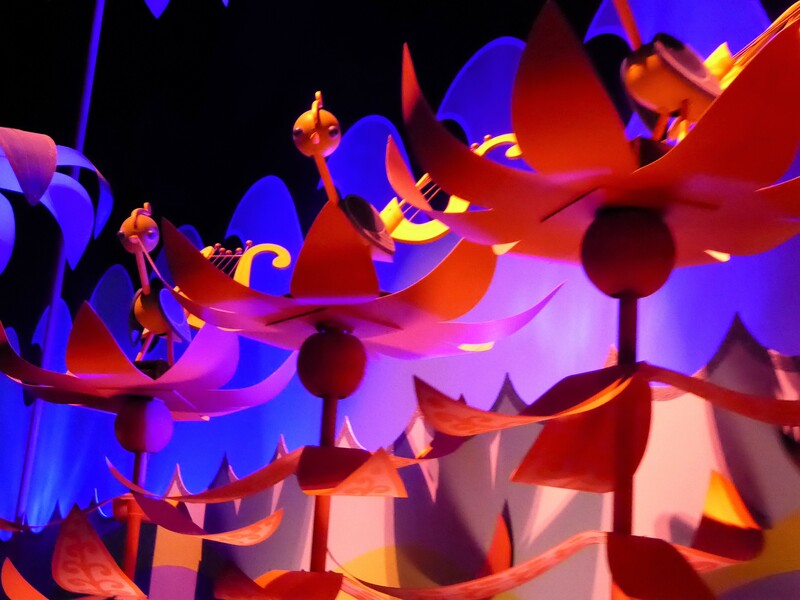 The designs within the attraction were cute and a great reminder of Disney’s first full length animated feature. Our son immediately wanted to ride the mine train again. The Verdict: Absolute fun. Our son’s favorite ride in the park. Gentle enough for young kids, but still with enough adventure for tweens, teens and adults. Since we were in Fantasy Land, it was time to test some of the family-friendly rides in the park. After the roller coaster, would our tweens still find the park’s slower, kid friendly rides magical? We checked out Peter Pan’s Flight, which is my favorite ride in the park. Our wait time was about 30 minutes, which is a short wait time for this popular family ride. Our son watched the Peter Pan movie over and over when younger, and we all appreciated the Pre-Neverland features as we waited in line. The ride itself was enjoyable, and the kids liked it, but after the thrills of roller coasters, they left the ride ready for our next adventure. The Verdict: A nice ride, but the tweens would rather re-ride a coaster. It’s A Small World is directly across from Peter’s Pan Flight. There was a five minute wait, so it made sense to jump aboard the ride through the countries. I feared this would be the ride they would least enjoy. And while it might have been, I was pleasantly surprised by how much the kids did enjoy the ride. Since there is so much to see as you cruise through the various worlds, the kids had plenty to keep their eyes and imaginations engaged. And while the ride is the most “cutesy” of all Magic Kingdom’s rides, the kids seemed to take it all in and accept the ride as an iconic Disney ride that everyone needs to experience at the park. The Verdict: An essential ride at the Magic Kingdom with enough features to keep a tween engaged at least one time. 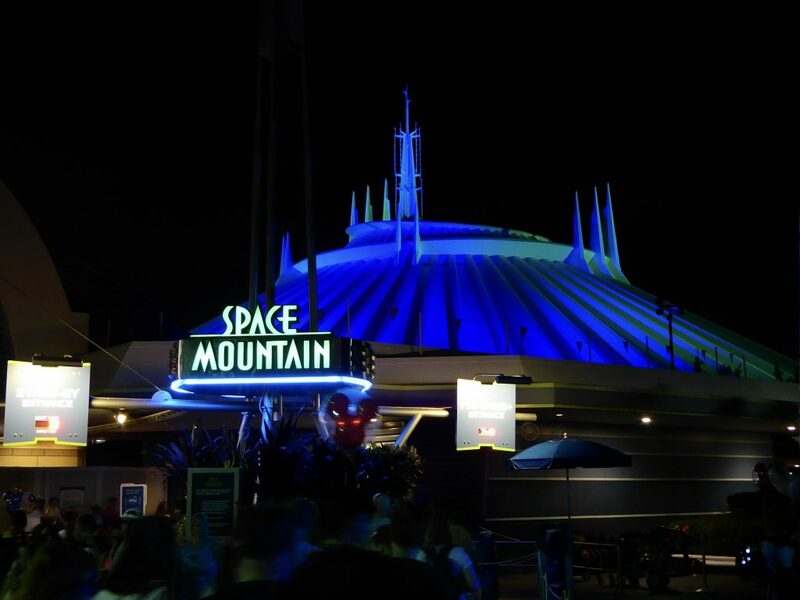 I took my son on Space Mountain when he was six-years-old. He hated it. He got bounced around and said he’d never ride it again. In the end, he decided to give the ride a second chance. And he was happy he did. Our daughter got to experience the interstellar coaster for the first time. She left with a smile from ear to ear. Yes, you get bounced around unexpectedly in the dark. But not knowing what’s coming next is what made the ride a must-ride for our kids. The wait time was about 45 minutes, although the marquee listed the wait time at 30 minutes. That was a little too long for us to wait. While there are design features throughout the line, they were not engaging enough for our kids. However, the ride itself made up for the longer wait. The Verdict: An absolute must-ride, even though the wait time was too long. 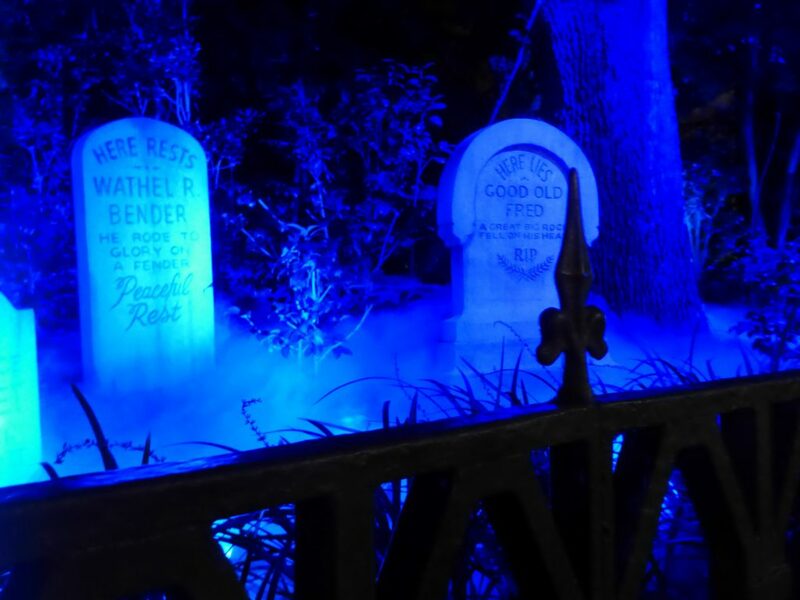 Our trip to the Magic Kingdom was in October, so the park was fully decorated for Halloween. And nothing was more decked out for the ghoulish holiday than the Haunted Mansion. Eerie lights illuminated the mansion. A fog machine spread ground fog around the graveyard. And a ghostly butler (played by a Disney cast member) regaled us with haunting speeches while we waited in line. We are not a family that enjoys being scared. This haunted mansion with its 999 haunts, however, was just spooky enough for us. Our kids watched the Eddie Murphy movie version, so they recognized many of the scenes enacted throughout the ride, such as the crystal ball and the spooks dancing in the dining hall. The Verdict: Not to scary, and not too tame, but just right. 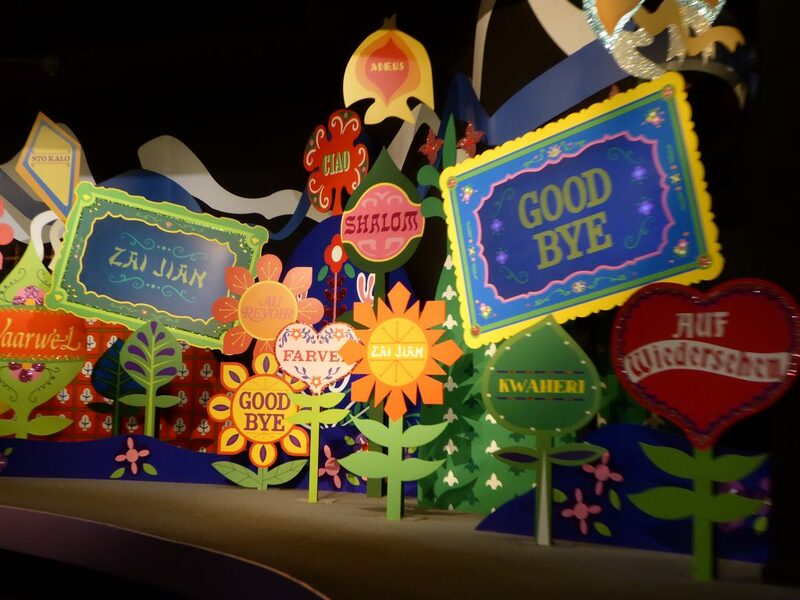 You cannot go to the Magic Kingdom without riding It’s a Small World and Pirates of the Caribbean. So, it’s fitting that Pirates was the last ride we rode during our visit. There was no wait time for us. We practically ran through the cue to get on our boat. That’s unfortunate, because we did not have time to appreciate the cue’s design features. 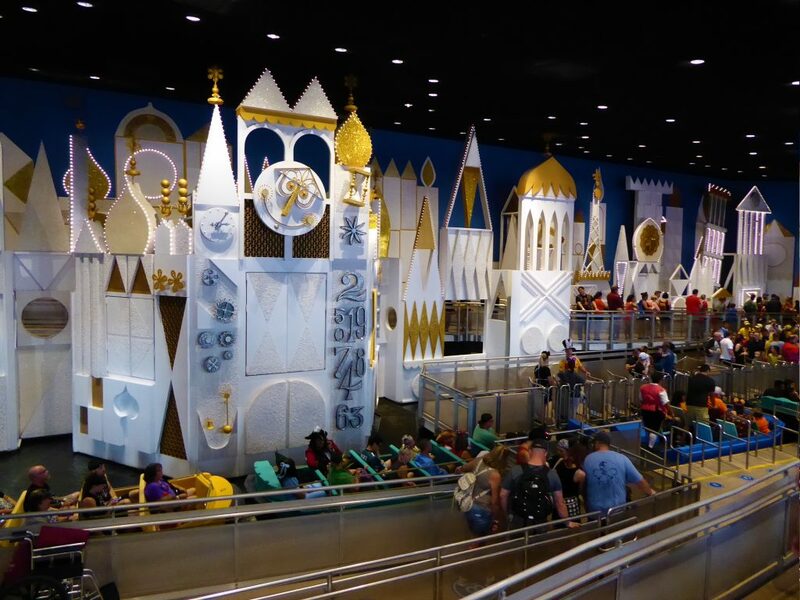 Like It’s a Small World, this ride has so much going on that it’s a constant feast for the senses. Whether we were dodging cannon fire or finding Jack Sparrow hiding from the authorities, we were swept away into the Caribbean world during the time when Pirates ruled the seas. 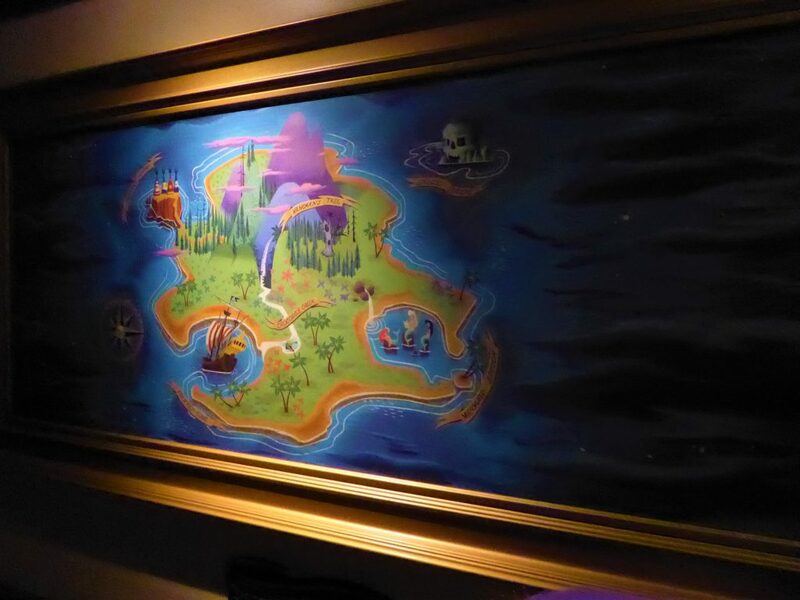 The ride has been re-imagined to include characters and scenes from the Pirates of the Caribbean movies (which was inspired by the Disney ride). While our kids have not seen the movies, they still know enough about them to recognize Jack Sparrow. The Verdict: An absolute must-ride with plenty to see. Not a thrill ride, but our tweens still felt they had been on an adventure. How Does the Parade Fare? Since we attended the Magic Kingdom in October, we went to the park during Mickey’s Not So Scary Halloween Party. We saw the Boo-To-You Parade during our visit. While it was different from Disney’s traditional Festival of Fantasy Parade, it was still a must see. We saw the late parade. Fortunately, we found a great viewing area at Main Street. We didn’t know how great, however, until the parade started. We sat if front of Tony’s Town Square Restaurant, near the park’s exit gates. When the parade worked its way down Main Street, it turned right where we sat. We had a perfect seating area. The Boo-To-You Parade presented Disney’s favorite characters (Mickie Mouse, Minnie Mouse, Tinker Bell) with Disney’s greatest villains (Maleficent, Cruella de Vil, Jafar, and Captain Hook). While waiting for the parade, we were treated to a dance party featuring Zootopia protagonists Judy Hopps and Nick Wilde. The parade entertained our daughter. Our son watched the show, but was not overly excited by the parade. How Do the Fireworks Fare? There’s a daily fireworks display at the Magic Kingdom. We saw the Happy Hallowishes display, said to be the best Disney show. Our vantage point for the fireworks had obstructed view with trees covering some of the display. However, since the fireworks set off around the park, we did get to see a great display. We love fireworks, and this show did not disappoint. How Does the Food Fare? Let’s be honest. We are frugal and like an economical meal. And Disney World food is pricey. We did get some snack foods (pretzels and sodas) while at the park, but ate big meals before our visit. The kids liked the food and my wife and I found it adequate. Maybe during our next visit, we’ll take advantage of the sit-down restaurants within the park. How Does the Merchandise Fare? Of course, our kids insisted we souvenir shop while at the Magic Kingdom. We did so at the end of the day, heading out of the park. Lugging bags of merchandise throughout the park and on rides is an abhorrent thought. We had a price limit per child. Trust me, we could have spent a lot more. We’re teaching our kids, however, that the experience is as memorable as a souvenirs. That being said, we still needed to get some souvenirs. The souvenir shops were busy and had a lot of choice. Still, we think that the World of Disney in Disney Springs may have more selection. I don’t know that the kids found exactly what they wanted at the stores. They did leave with something to remember their trip. All in all, I would say that the merchandise was a disappointment for our tweens. This may have more to do with our price restrictions than with the selection. 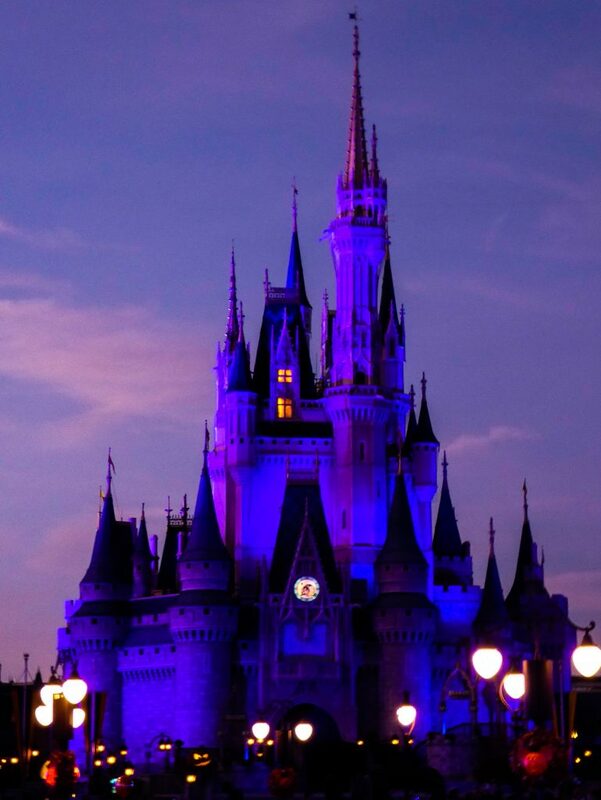 Disney makes your vacation easy to enjoy with the Magic Band and the My Disney Experience app. The Magic Band is a wristband you can wear throughout the park. Simply scan the Magic Band in order to access your Fast Passes, gain entrance into the park, or purchase food and merchandise. The Magic Band also can be used to add photos to your My Disney Experience. 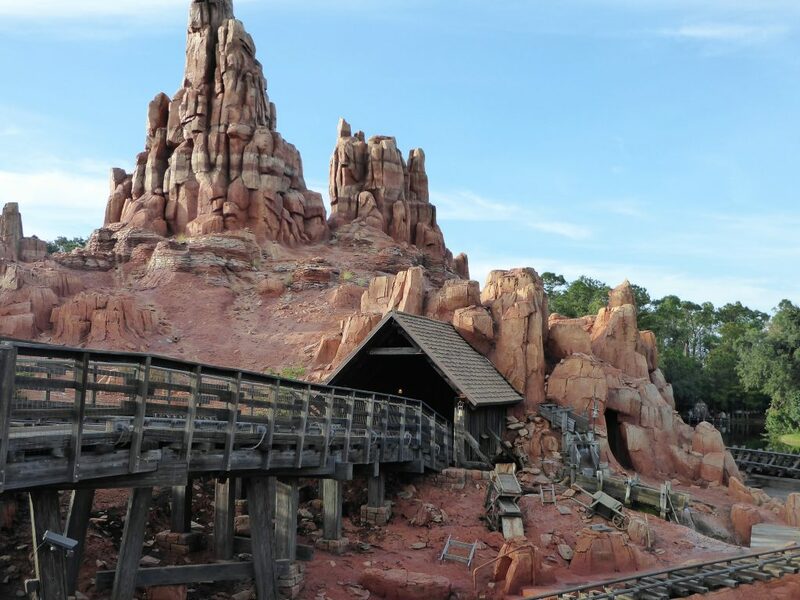 After we returned home, we logged on to our My Disney Experience app and found not only those photos we had posed for, but also photos of us on rides like Pirates of the Caribbean, the Seven Dwarfs Mine Train, and Splash Mountain. Our favorite was a video of the Seven Dwarfs Mine Train, with actual footage of our family on the ride. Your Magic Band is used throughout the Walt Disney World resort. It serves as your room key if you are staying on site, and can be used for charges in the park and at Disney Springs. We wisely asked that our kids not have charging privileges attached to their Magic Bands. The My Disney Experience app is a helpful app for use within the park. The app allows you to pull up attraction wait times and locations for character meet and greets. After we left the park, we were able to see all of our photos from the My Disney Experience app. We also used the app weeks before our vacation to track average wait times during specific times of the days so we could create an optimal plan for our trip to the Magic Kingdom. 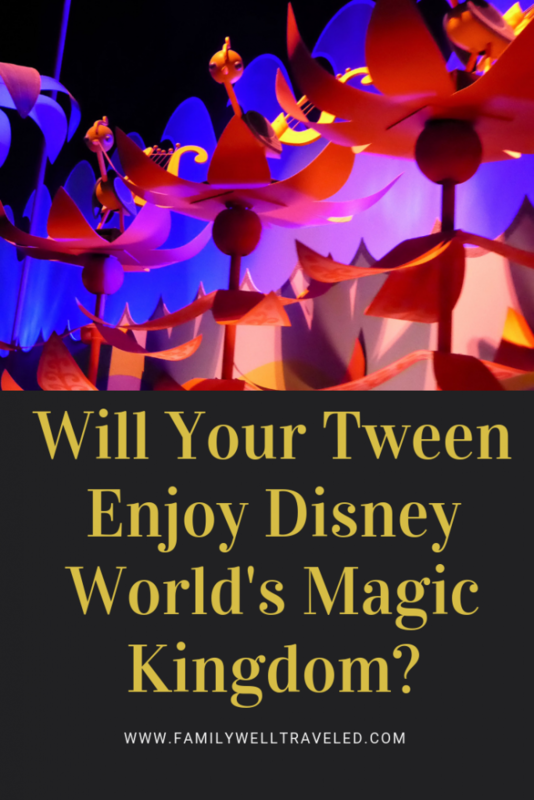 Is the Magic Kingdom enjoyable for tweens? The park has some attraction appealing to a younger age group. And tween-aged children are notoriously hard to please. In the end though, our tweens did enjoy the Magic Kingdom and still want to go back. While their enthusiasm was not as robust as a younger child, there still were enough smiles and joy to make the park magical for our tweens. Taking a Disney Cruise? See What You Need to Know Before You Board Your First Disney Cruise. See Family Well Traveled’s Complete Guide to Mickey’s Not So Scary Halloween Party. I have a tween too, and I agree with your analysis. 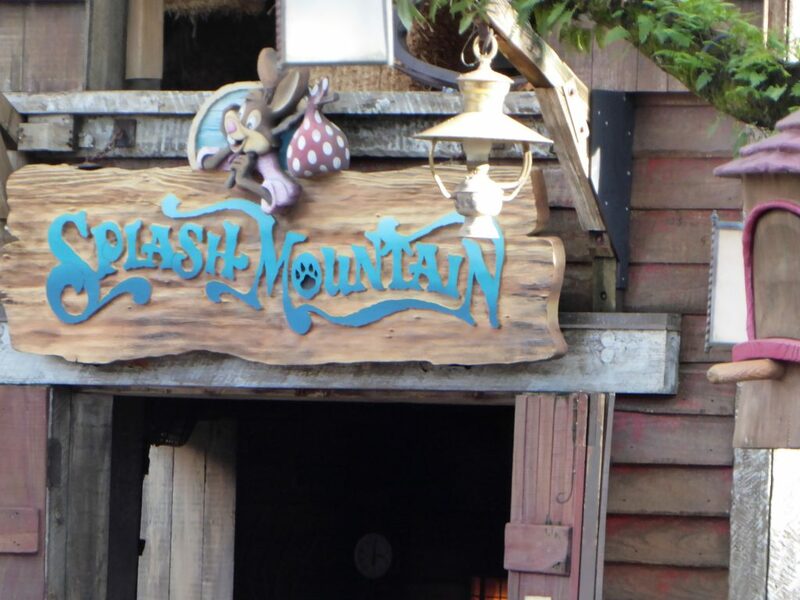 He enjoys Splash Mountain, Thunder Mountain, Space Mountain, the Mine Train and will do some of the other rides for nostalgia. Pirates is always a must do (sentimental value). Tweens can definitely enjoy Magic Kingdom!